Create Ultra HD connections between your High Speed HDMI-equipped devices, up to 80ft away with no signal loss. 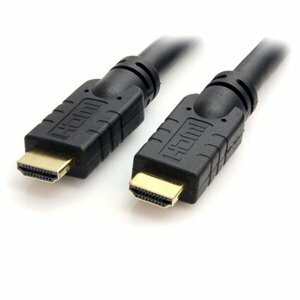 The HDMIMM80AC Active High Speed HDMI Cable features 2 HDMI (Male) gold connectors and has a built-in, active signal booster that provides connection distances up to an astounding 25 meters (80ft) and does not require an external power adapter - an ideal solution for connecting distant HDMI-enabled devices such as Blu-Ray players, game consoles, HDTVs, DVD players and more.This high quality HDMI cable fully supports 1080p+ resolutions at up to 120Hz refresh rate, with life-like color. To accommodate the demands of future high definition devices, such as increased resolutions and higher frame rates, this Ultra HD cable supports resolutions up to 4k x 2k. The HDMIMM80AC Active High Speed HDMI® Cable features 2 HDMI (Male) gold connectors and has a built-in, active signal booster that provides connection distances up to an astounding 25 meters (80ft) and does not require an external power adapter - an ideal solution for connecting distant HDMI-enabled devices such as Blu-Ray players, game consoles, HDTVs, DVD players and more.